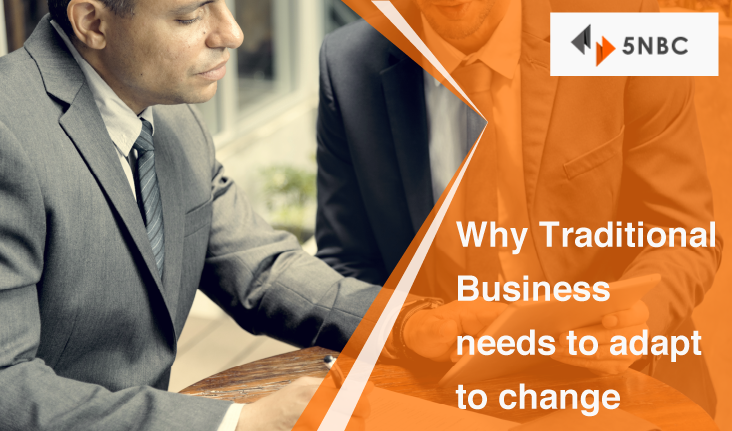 Why Traditional Business needs to adapt to change. Change is the only constant which is quite often forgotten in traditional run business, the thought of why know keeps them in shell and when the time demands the change unable to match it makes them lose out on the hold which it had. Traditional business usually is run on bottom line where in more thinking is done on how build profitability and how to cut cost rather than thinking of how to increase value and market penetration and how to position is never given change even if thought it is always on second priority. Investments always take priority where in traditional business wants to invest on its own rather than investing on business segments of technology, expansion, marketing & hiring resources at higher levels. This leads to crunch in thought process and the minds available in the think tank is reduced to one person vision and sight which becomes dangerous for the company. Traditional business should always invest on resources, expansions, R&D and diversifying the business and compliment the existing business with various components that can bring value to enterprise. Doing same old tradition method of cutting cost and trying to get work done rather than building process and investing money in the same is never given though as why invest know when we are doing good is the question to be answered. Why B2B Companies need to look at B2C Model? What stops Traditional Business from re inventing?